Biking is growing as a passion in India. With technology enablers like maps and online riding forums, more and more bikers are converting to enthusiasts. Enthusiasts are affluent, own premium bikes and aspire to have a great experience when they go out for a ride. They are ready to pay a premium for accessories that add to the experience. But a great riding experience with a battery-drained mobile is a problem for most. Getting a permanent solution to this problem was what was on Satyajeet Mohanty's mind, the co-founder of Hyderabad-based Bolt Auto Technologies Pvt. Ltd, when his firm first launched the Bolt Red Streak and Bolt Pocket, a 2A USB charger with a pouch to secure the phone on the bike along with the Bolt Riders App, to track rides and auto-curate ride stories to share with co-riders and friends. Launched in July 2015, the bootstrapped Bolt device faced all the challenges a startup faces. Mohanty and Ronak Kumar Samatray (co-founder) both believed in the power of stories and the Bolt Riders App was the perfect answer to it. By providing a charger and a place to secure a phone on the bike opened the gateway for riders to leverage their phone and internet during their rides. The Bolt Riders App is designed to take advantage of this fact and deliver greater value to riders. 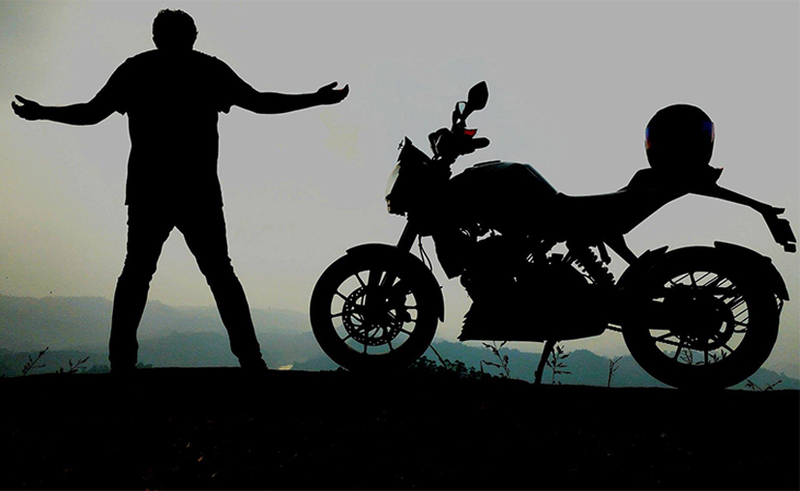 The app helps tracking rides and creating travelogues/riding stories with minimal interaction from the rider. The travelogue is a well-designed story of the ride and is easily sharable and convertible to a physical memorabilia. Like most new products, the sale of the Bolt device was also slow. But what kept the duo going was the feedback from users, "The users absolutely loved what we had built and all the benefits we had thought of resonated in their reviews. They also recommended Bolt to their friends. This got us really excited and made us confident to push the product in the market," Mohanty told Techcircle. "We are a premium product with great value for money and our approach to market is top down. This strategy makes it very hard in the beginning but once we hit the tipping point we will get great results for our efforts," added Mohanty. Targeted at riders in tier I and tier II cities, the biggest USP of the device according to Mohanty is that it's manufactured out of the co-founder's own small scale set up out of Hyderabad. "One of the most important design parameters for us was ease of manufacturing. We have two separate teams for production and quality. We have a stringent quality process with quality checks after every step of manufacturing to ensure low rejections at the final stage. We also monitor the rejections at every stage and come up with process changes regularly to improve efficiency and reduce rejections," said Mohanty. The complete package is priced at Rs 1,699 with a one year warranty activated by download of the app. The future at Bolt is in building a one-stop solution app for anything a rider needs. The customer acquisition and engagement for the app will drive various hardware developments. Bolt Beacon: The technology under development will provide a seamless experience to riders as an anti-theft device, a holder for the phone on the bike combined with a charger. Bolt Riders App: The app aims to become a community for riders providing value to each individual rider. It will position as an entry point to any rider who wants to pursue his passion for riding. Techcircle did a small review of the Bolt device. The Bolt charger was delivered in a big box along with a USB cable, tank pouch, battery connector and an instruction manual. The installation process was fairly simple and it took less than 10 minutes to install. Charging & portability: Within just 15 minutes of charging the phone through the Bolt device, the battery shot up by almost 7 points. However, the charging capacity reasonably reduces once the GPS navigation is turned on. The detachable charger gets brownie points for its portability and lightweight; having said that, it nearly came off at a bumpy stretch of road. TC take: A power on/off button on the charger could have been an added feature for better functionality. App: Unlike all the Chinese bike chargers, the Bolt bike charger comes with a dedicated app to track various metrics including ride time, average speed, distance etc. However, the overall Bolt experience hits downside when you use the app. The app tracks different metrics quite fine but flashes a pop-up every time a device is plugged in. The app ride history did not have a record despite five rides using the app. There may have been a process to save the rides but it wasn't visible. TC take: There is a wide scope of improvement on UI/UX side and also on the overall app experience and functionality. Verdict: You should buy the Bolt charger for its portability, charging abilities and for the looks. While if you want to track your ride at the same time, you can use variety of third-party apps. We are yet to try the Bolt charger on a long trip but for the first few hours it looks promising.